This Christmas, Andrew (oops, sorry, Father Christmas!) 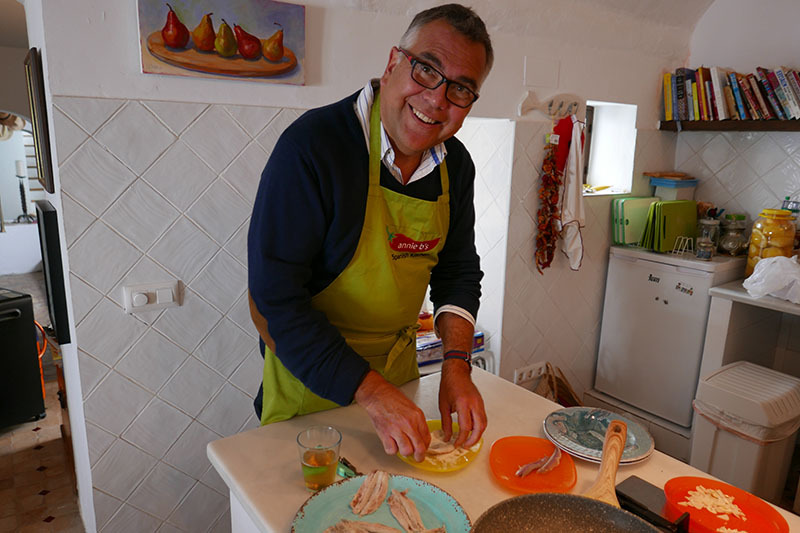 gave me some rather splendid and very memorable presents, and one of these presents was a day’s cookery course with Annie B, who runs a cookery school in Vejer de la Frontera. 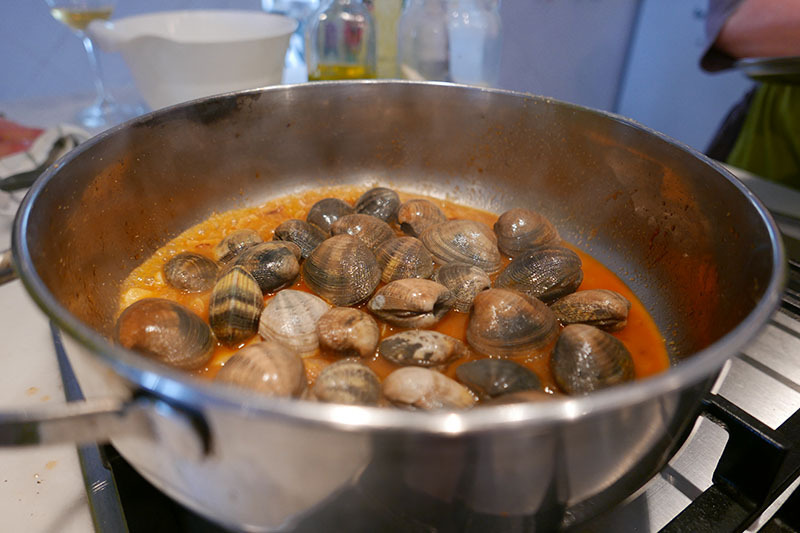 Andrew (not Father Christmas) and I both love cooking, and since we have been in Spain, we have discovered a love of working with fresh local produce and the joys of spontaneous recipe creation using what is available. As I write this, having just got back from our weekend away in Vejer, a ‘left-overs’ quiche is baking in the oven - sheer satisfaction! Christmas seems eons ago. The first quarter of this year has disappeared in a blur of work, unseasonably wet and cold weather, planning for the new house and all sorts of other minutiae of daily life. It has been something of a period of adjustment, facing change and making decisions for the future, and all of these processes can be unsettling. I had to leave Andrew to make the arrangements for our long weekend away, during which we would meet Annie Manson, the 'Annie' of Annie B’s Cookery School, whose large reputation preceded her. If I had a Euro for every time the name Annie B was mentioned in exalted terms, I would be a rich man. As this year galloped along at a pace, suddenly here we were in April, still in the depths of winter that was rapidly losing whatever charms it may have had, and wondering where on earth Spring had decided to flit off to, never to return. 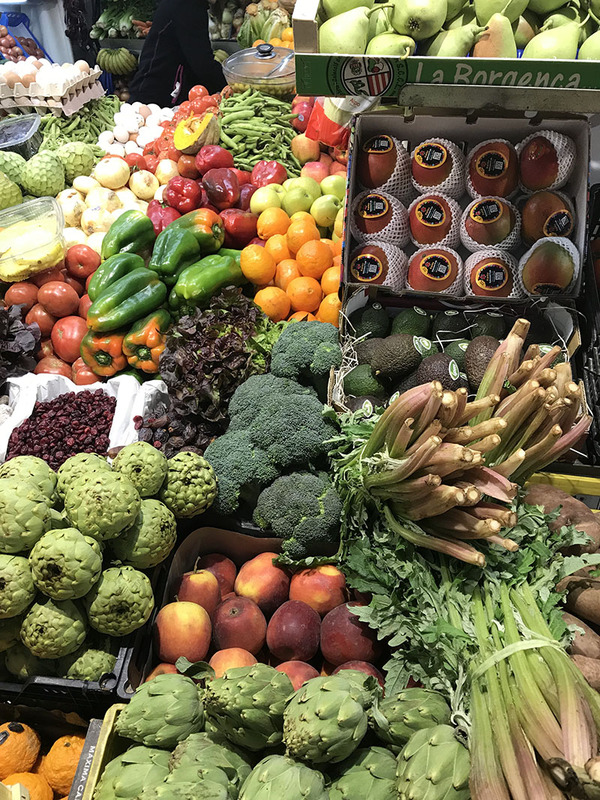 The date for our trip to Vejer was upon us before I had time to blink and poor Andrew must have thought that the last thing I needed was a drive to Cádiz Province to buy and cook food. Both of us, to be fair, were working flat out and even on the day of our journey west, I had to work and we set off immediately afterwards from Granada. To improve my already black mood, the heavens opened yet again, and as we drove the 3.5 hours across Andalucia, the rain got heavier and heavier, and the skies darker and more foreboding. I was grumpy, grumpy, grumpy…..and Andrew had planned such a wonderful trip. When we arrived... this gives you a flavour of what this Spring has been like in Andalucia! I will skip lightly over our arrival in the delightful village of Vejer de la Frontera, but it was wet. In fact, it seems that every time we have been to Vejer, the weather has not been on our side. Once again, we stayed in La Botica, a simple but charming small hotel close to the centre of the old village. That night, we trotted out to a restaurant that had been recommended on our previous visit but was closed on that occasion. Fortunately, this time it was open, despite many other bars being determinedly closed due to the Fería, and we slotted in beside the bar and ordered gin - our remedy for even the bluest of moments. The evening improved, until we got the bill for our dinner to discover that we had been charged 62€ for a single T-bone steak, but I think we might come to that tale in the next blog post. (Read our Tripadvisor review here ) This post is about cooking. On Friday 13th April (lucky for some), we met Annie B in the Plaza de España where she was due to collect us in her natty Citroen Cactus and whizz us off to Barbate, on the coast, where we’d buy fish. Annie had asked us beforehand what we might like to cook, given that we had some knowledge of a few Spanish staples, and I have always wanted to know a little more about tackling fish. I love fish, but get squeamish when it comes to preparing the little devils. 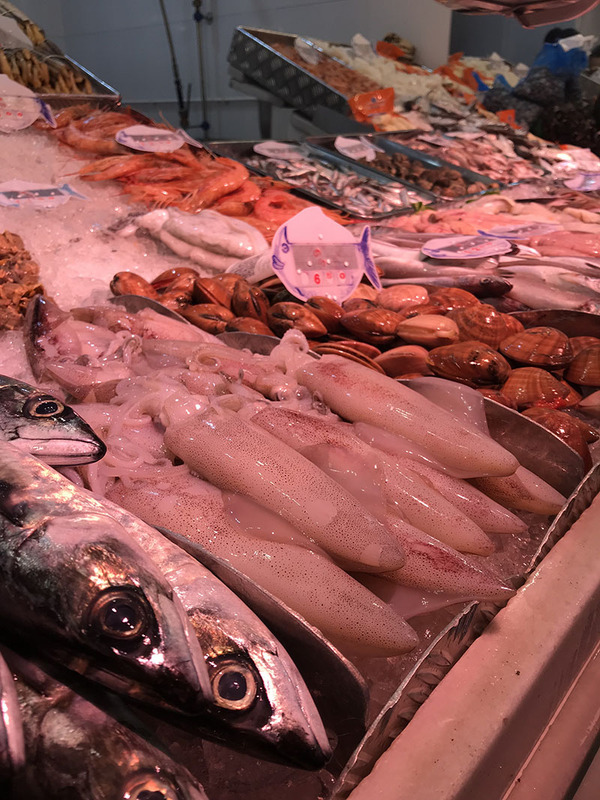 I thought, given that we were to be cooking in Annie’s home which is a mere stone’s throw from the Costa de la Luz, it would be impolite not to step beyond my little comfort zone, and grab some seafood with a degree of bravado. 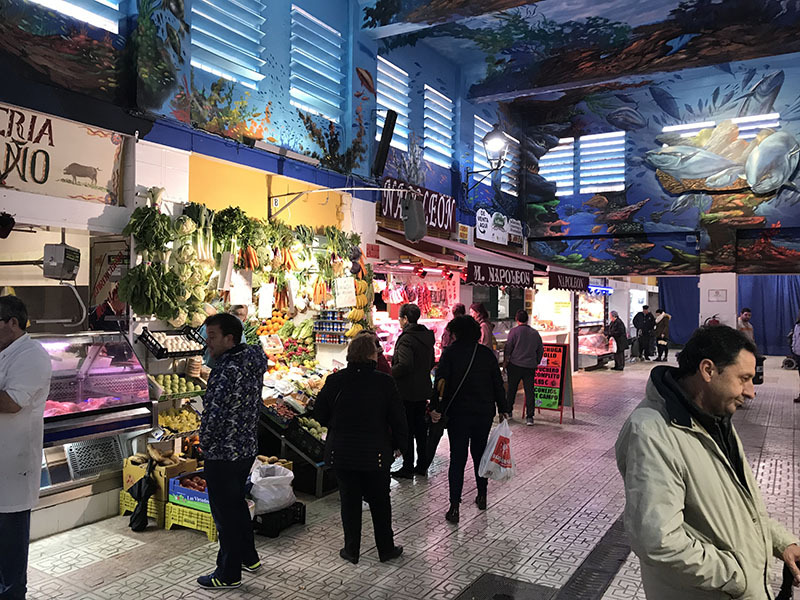 Anyway, reviews aside, we were bundled into Annie’s Cactus and whisked off to Barbate, a coastal town that has seen better days but is one of the centres of this region’s huge Tuna industry. When we first moved to Spain, we had no idea that Tuna was so huge, despite tuna being a staple ingredient in so many recipes throughout Andalucia. Tuna, in huge shoals, leave the cold Atlantic for the warmer Mediterranean in May every year to spawn, and the local Tuna industry goes into overdrive. This is nothing new, as the Almadraba, as it is called, has been part of life here since the Phoenicians and Romans settled along the coast. The Almadraba is a big affair, as the villages and towns burst with activity as the catches of Atún Rojo are brought ashore and prepared for consumption in every which way; no part of the tuna goes to waste. These magnificent fish are treated with respect, as the Japanese (who are masters at Tuna fishing) believe fervently that a stressed fish will result in tough meat, so the fish are caught and killed with great care, and the stocks are closely monitored to prevent any over-fishing. As we arrived in Barbate, and made our way to the market, a monsoon hit town! It threw it down, and the rather down-trodden face of Barbate looked even more crestfallen beneath the torrential rain. 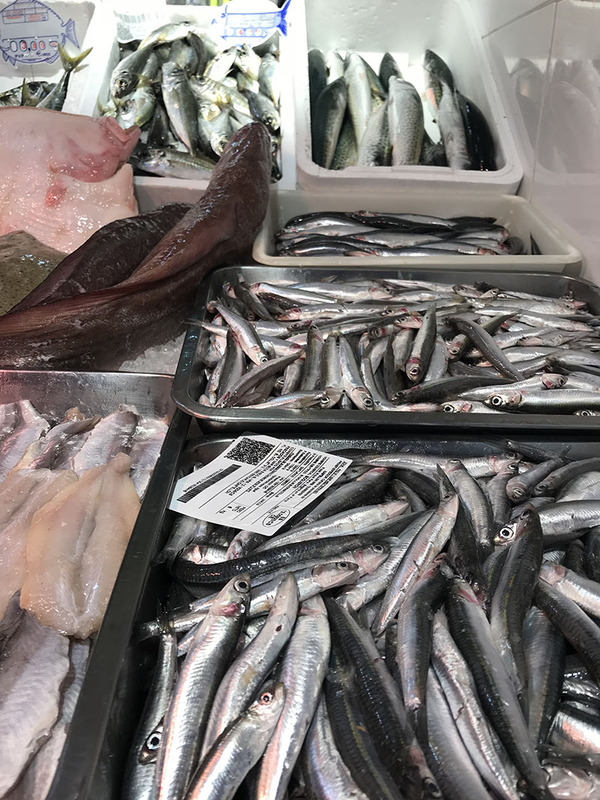 Not to be beaten by the weather, Annie took us to the local market and lead us from stall to stall, guiding us through the various types of fish laid out, and how to spot and feel the freshest specimens. We loved the spontaneity of this shopping trip….do we fancy prawns? Yes please? Clams? Why not? Fish to bake in salt, boquerones to pickle and fry. Fish bought, we went in search of fruit and vegetables and learnt that you simply ask the supplier for ingredients based on what you intend to cook. Sweet onions and tomatoes for a Picadillo salad, potatoes for boiling as opposed to baking or roasting. Fresh herbs, oranges, peppers, strawberries from Coníl, as dark red, flavoursome and juicy as you are ever likely to find, all went into the bags and off we trotted, back to the car. Annie’s cookery courses are so much more than a bit of culinary tuition in the kitchen. As one of the reviews above hints at, knowledge of the food of this region, and a love of fresh ingredients runs right through Annie. On the way back to the car, we stopped in at the shop of one of the major Tuna producers in the Province, Herpac, where you can find every type of Tuna product. We had a chat about the rather snobbish view of tinned products back in the UK, when actually tinned products can be as fine as anything else you preserve. Tuna here is often tinned and is a superb ingredient for so many dishes. Tuna is sold fresh, cured or preserved in pig lard. On the wall of the Herpac shop, photos and posters illustrate the catch, the filleting (el ronqueo), and the various joints of the fish. This is all but a temple to Tuna, and naturally a few tins were bought. We scuttled back to the tight little streets of Vejer de la Frontera armed with goodies, and made our way into Annie’s lovely home - the roof terrace here provides some of the best views of Vejer, across to the old town and then over to the coast in the near distance, but the weather indicated that we would only be able to eat al fresco if we were happy to run the risk of an impromptu drowning, so indoors we remained. I don’t believe in giving away any trade secrets, so I have no intention of running through every recipe. 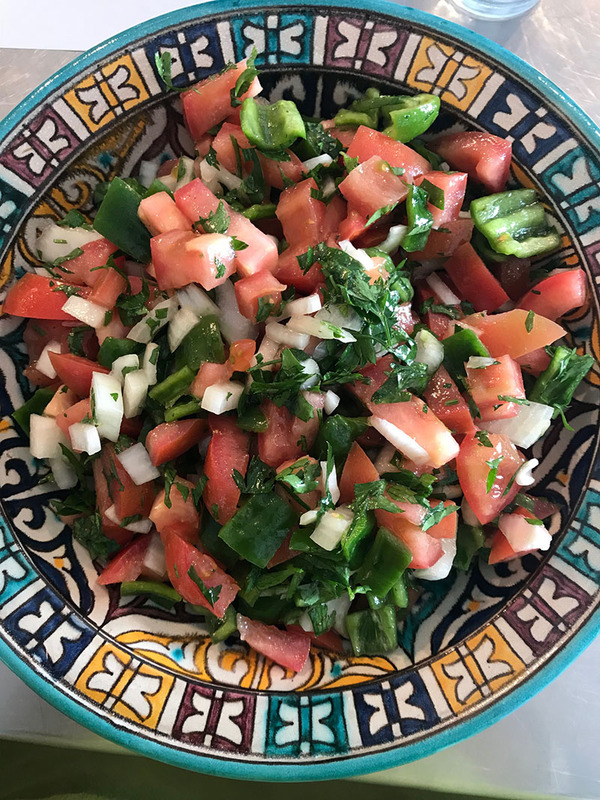 If you would like to learn a few secrets about the joy of Spanish and Moroccan food, then you simply must treat yourself to at least one day with Annie (contact details below). What I will say is that we managed to bake a delicious cake, knock up a fresh, colourful and scrumptious Picadillo salad, a salsa verde, pickled some boquerones (having gutted them first! ), fried some boquerones, baked 3 fish in a salt crust, simply boiled some prawns and cooked clams in a sherry and garlic sauce. Then we ate as much as we could, and what we couldn’t manage we took away. As we mentioned above, Annie’s cookery courses are not just about food. Annie is equally passionate about the wines of the area, and in particular sherry - that divine but often misunderstood fortified tincture that originates in the tiniest corner of Andalucia, between Sanlucar de Barrameda, Jerez and El Puerto de Santa Maria. Annie is canny, and knows from experience that too much sherry sampling before the cooking is done could result in some unfortunate mishaps, but at exactly the right moment, the Manzanilla and Fino big guns are wheeled out and there can be few better combinations that an ice-cold Fino with the freshest of fish. Any remaining stresses that lingered from the previous day evaporated in a whisk, a blitz, a quick agitate and the sharing of the tastiest dishes made from the simplest ingredients. Please feel free to comment on, or share this post. We do love getting your feedback! ...and that evening the sun came out. This is the view from our hotel room.